USES: Montelukast is used regularly to prevent the wheezing and shortness of breath caused by asthma and decrease the number of asthma attacks. Montelukast is also used before exercise to prevent breathing problems during exercise (bronchospasm). This medication can help decrease the number of times you need to use your rescue inhaler. This medication is also used to relieve symptoms of hay fever and allergic rhinitis (such as sneezing, stuffy/runny/itchy nose). This medication does not work immediately and should not be used to treat sudden asthma attacks or other breathing problems. This drug works by blocking certain natural substances (leukotrienes) that may cause or worsen asthma and allergies. It helps make breathing easier by reducing swelling (inflammation) in the airways. HOW TO USE: Read the Patient Information Leaflet if available from your pharmacist before you start taking montelukast and each time you get a refill. If you have any questions, ask your doctor or pharmacist. Take this medication by mouth with or without food as directed by your doctor. The dosage is based on your medical condition and response to treatment. If you are using the chewable tablets, chew them thoroughly before swallowing. If your child cannot safely chew and swallow them, consult the doctor or pharmacist for advice. Take this medication at the same time each day. If you are taking this medication for asthma or for both asthma and allergies, take your dose in the evening. If you are taking montelukast to prevent only allergies, take your dose either in the morning or the evening. If you are taking this medication to prevent breathing problems during exercise, take your dose at least 2 hours before exercise. Do not take more than one dose in 24 hours. Do not take a dose before exercise if you are already taking this medication daily for asthma or allergies. Doing so may increase the risk of side effects. Do not increase or decrease your dose or stop using this medication without consulting your doctor. Continue to use this medication regularly to keep your asthma under control, even during sudden asthma attacks or periods when you have no asthma symptoms. Continue to also take other medications for asthma as directed by your doctor. This medication works over time and is not meant to relieve sudden attacks of asthma. Therefore, if an asthma attack or other breathing problem occurs, use your quick-relief inhaler as prescribed. You should always have a quick-relief inhaler with you. Consult your doctor or pharmacist for more details. Get medical help right away if your asthma symptoms worsen and your quick-relief inhaler is not helping. Tell your doctor promptly if asthma symptoms, breathing problems, allergy symptoms, number of times you use your rescue inhaler persist or worsen. PRECAUTIONS: Before taking montelukast, tell your doctor or pharmacist if you are allergic to it; or if you have any other allergies. This product may contain inactive ingredients, which can cause allergic reactions or other problems. Talk to your pharmacist for more details. Before using this drug, tell your doctor or pharmacist your medical history, especially of: liver disease. Before having surgery, tell your doctor or dentist about all the products you use (including prescription drugs, nonprescription drugs, and herbal products). The chewable tablets may contain aspartame. If you have phenylketonuria (PKU) or any other condition that requires you to limit/avoid aspartame (or phenylalanine) in your diet, ask your doctor or pharmacist about using this medication safely. During pregnancy, this medication should be used only when clearly needed. Discuss the risks and benefits with your doctor. It is unknown if this medication passes into breast milk. Consult your doctor before breast-feeding. DRUG INTERACTIONS: The effects of some drugs can change if you take other drugs or herbal products at the same time. This can increase your risk for serious side effects or may cause your medications not to work correctly. These drug interactions are possible, but do not always occur. Your doctor or pharmacist can often prevent or manage interactions by changing how you use your medications or by close monitoring. To help your doctor and pharmacist give you the best care, be sure to tell your doctor and pharmacist about all the products you use (including prescription drugs, nonprescription drugs, and herbal products) before starting treatment with this product. While using this product, do not start, stop, or change the dosage of any other medicines you are using without your doctor's approval. 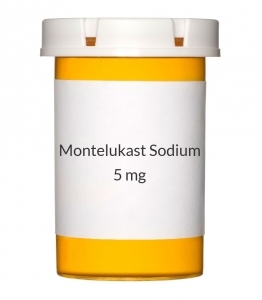 Some medications can affect the removal of montelukast from your body, which may affect how montelukast works. Examples include phenobarbital and rifampin, among others. This document does not contain all possible drug interactions. Keep a list of all the products you use. Share this list with your doctor and pharmacist to lessen your risk for serious medication problems. NOTES: Do not share this medication with others. Laboratory and/or medical tests (such as lung/breathing test) should be performed periodically to monitor your progress or check for side effects. Consult your doctor for more details.